And you thought getting tickets to the actual World Series games was expensive. 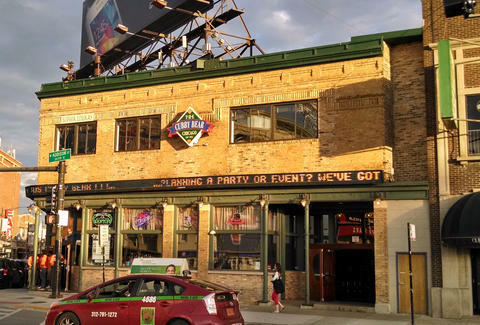 With today feeling like the night before Christmas for Cubs fans, Wrigleyville bars are cashing in on the excitement over the first World Series game for the Cubs since 1945. For starters, The Cubby Bear is charging $100 just to get in the door (but good luck getting in; the line started forming at 5am). Neighboring bar HVAC is asking you to cough up $250 per person during Game 4’s Saturday watch party, though that at least gets you drinks and buffet access, if no guarantee of an actual seat. That’ll cost you $1,000. Nope, we’re not kidding. To guarantee entry, some Cubs fans already packed Wrigleyville bars, such as Murphy’s Bleachers, all before their morning coffee. Maybe they’re just planning on camping out there all weekend? If you want to forego these insane cover charges, there are plenty of bars in Chicago where you can grab a beer and watch the game for a much more reasonable price (like, free). Ciera Velarde is an editorial production assistant at Thrillist who still has her Harry Caray souvenir glasses from the first time she saw a game at Wrigley when she was six. Follow her on Instagram.